Located on the same side of the street as the ocean (NOT across the street from the ocean), the Orchid cottage has limited views and easy access to the whitewater coastline. Walk along the coast in either direction or fish from the cliffs. Soothing sounds of the waves crashing along the shoreline can be heard day and night. This spacious 1-bedroom 1-bath house is an affordable accommodation for an individual or couple who wants to be near the ocean. The house has a fold out couch for additional guests. A high quality inflatable mattress is also available instead of the fold out couch. Very clean and exceptionally well appointed. Kitchen, full-sized washer/dryer, high speed internet (WiFi), Amazon, Netflix, and the better cable alternative Sling TV. Click on the Video tab for video walk through of house. This house is also featured on VRBO (house 397903) and Airbnb. The availability calendar is integrated with all marketing channels and always updated for accuracy. The Ginger house is located south of Hilo town. Just 25 minutes to central Hilo. An easy 35 minutes drive to the Volcanoes National Park. Close to Big Island Hawaii guest activities and the warm pond swimming area (about 15 minutes by car). Approximately 25 minutes drive to Hilo swimming, snorkeling, and surfing beaches – Richardson’s Beach park. Near Downtown Hilo yet it feels like a secluded Hawaiian town. Just minutes from beautiful Pahoa and on the way to the Kalapana Lava viewing area and other Pahoa sights (Champagne ponds, Ahalanui Beach Park – Warm ponds, Maku’u farmers market). Same distance to Volcano National Park as Hilo. Please visit my dedicated website at www.hilovacationhomes.com. The Hilo Activities tab has the best organized overview of the many activities in and around Hilo organized by driving direction. Not sure which house is best for you, simply call me at (818) 357-6889. • Large, 900 sq. ft. guest house with separate step down bedroom. The sofa is a fold out bed in addition to a day bed with a twin mattress. • 12 miles from Downtown Hilo. • Walk to rear portion of the property for amazing sunrises and ocean views. Whale watching during the winter months. Chairs available at the house to bring back to the edge of the property. • Live in a community of Hawaiian residents and learn why so many people decide to retire in this area. • Why settle for a house away from the water? This house rents for the price of a hotel, but includes a complete kitchen and washer/dryer. • Often rented for long term stays, the house is private with little traffic on the street in front and an unused garage separating this house and the main house. • House is completely stocked. Everything you need for cooking, plenty of towels, soap, shampoo, hair dryers. Ironing board/Iron, playpen, highchair and Cable Wifi, Netflix and Sling TV. • Living Room – Large couch and day bed for plenty of seating. Couch folds out into queen size bed if your party is larger than 2. Flat screen T.V. with Amazon Fire controller. This as Amazon Prime and Netflix for a huge selection of prior shows and movies. For current shows and sports, the better cable alternative Sling T.V. offers all the usual cable stations in a slick user interface. Small selection of books and games for the evening. • Kitchen – Everything you need. Coffee maker, blender, toaster, rice cooker, pots/pans. Lots of cooking tools. Large oven/range. • Master Bedroom – Very large, step down separate bedroom with King size mattress. premium sheets, nightstand, dresser, clock and ceiling fan. Sliding glass door to outside porch and limited view to ocean. • Bathroom: Single bathroom near front door in living room. Bath towels, hand towels and wash cloths, hair dryer, shampoo and soap provided. There is more to do in and around Hilo than any town on any of the Islands. It just isn’t well advertised because there aren’t resorts to promote the area. Please visit https://hilovacationhomes.com/hilo-activities/ for the best organized site – showing activities by driving direction. • Gardens – Hawaiian Botanical Gardens, Lili’uokalani Park and Gardens, Nani Mau Gardens, Akatsuka Orchid Gardens. • Museums – Lyman’s historical and geological museum and The Tsunami museum. Both in downtown Hilo. • Beach Parks – Richardson’s Beach Park, Onekahakaha Beach Park (the calmest), Carlsmith Beach Park, Reed’s Bay, Lehia Park. Punalu’u Beach Park and Whittington Park. • Volcanic sights: Volcano National Park, Thurston lava tube, Kaumana Caves State Park, Pahoa transfer station, Live lava bike/hike tours in Kalipana Viewing area. • Shop large stores for all your supplies. Just a quarter mile above the Hilo airport is a Walmart, Target, newer Safeway, mall with modern movie theater and cute stores. • Looking for familiar fast food? In the same area is a Burger King, Panda Express and Starbucks. Just up the street on the north side is a Subway, Jack in the Box, McDonalds and Domino’s Pizza. We offer a nice section of 2-4 bedroom vacation rental homes located RIGHT ON THE OCEAN OR FRONTING THE BEST HILO BAY BEACHES IN HILO TOWN. March 16, 2017 Speardog said.. Copied from VRBO: After carefully reviewing property and others in the area we had a good idea of what we were getting when we arrived. We weren't disappointed, everything was as advertised. The bed was comfortable and the kitchen was adequately stocked. We loved going down to the ocean where there was no shortage of sea turtles and were lucky there was not another family in the house next door during our stay. Richard sent us a nice packet with places to see and other helpful hints. The internet was reliable and the Roku was worked fine after getting used to the remote. The stay was great and would rent again. Only issue was the fire alarms. The one in the bedroom went off three times for no reason. One time it went off at 2:00 a.m. and would go off and on for about 20 minutes. The one in the living room is placed directly over the stove. It constantly went off while cooking some grilled cheese sandwiches. There is no air conditioner in the house and I imagine during the summer this could be an issue. I would recommend that another stand-up fan be added to the house so one could be in the living room and one in the bedroom. My Response I'm glad your stay was nice - except for the fire alarms. Both of them the are only about I month old! I replaced them both when I was there last. Very frustrating and I'm sorry about that. I will certainly move the living room one away from the kitchen area. It has always been there so I just replaced it in the same spot. That's clearly not a logical spot for a smoke detector. 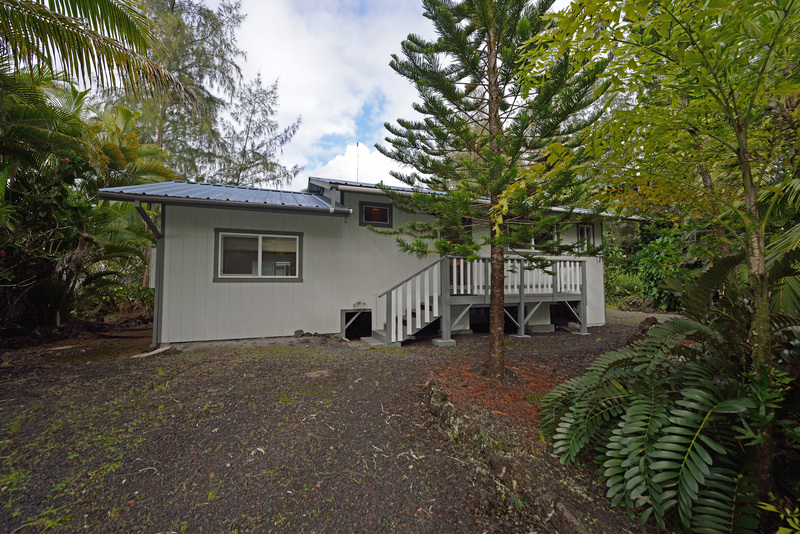 Hope to see you again back in when needing a vacation rental on the Big Island near Hilo. March 9, 2017 Rienna W Copied from VRBO: Such a nice cool location. Super cozy location and home. Couldn't of asked for anything else! Such a great time and loved the cliffs to watch the sun come up and water hit the rocks! Feb. 27th, 2017 Anonymous Copied from VRBO: Enjoyed our stay here (3 days). Good location for visiting anything on the east side of the Big island-Hilo, Volcano National Park, Rainbow falls, thermal beaches to the south. Good value! Feb. 11, 2017 Deborah C Copied from VRBO: We stayed 3 nights in this cute cottage. The sounds of the ocean at night and the birds in the morning was great. We took many long walks all around the area. Met a lot of very friendly local dogs and their equally friendly humans. Communication with Richard was easy and clear. Would definitely stay here again when we need a vacation rental on the Big Island . Mahalo Richard! Nov. 16, 2016 Allison R. Copied from VRBO: he house is located on a spectacular section of coast on a quiet road. The kitchen is clean, but not well furnished with cookware or large bowls. The house is spacious and was very comfortable for my husband and me. I would recommend it for two or three people. It is a longer drive from Hilo than indicated on the website, but the location is good for those wanting to get to the Park and the lava flows. Response: I have since stocked up the kitchen. Things disappear over time. Hope to see you back when you are looking for a vacation home on the Big Island. Sept. 12, 2016 Emily M. Copied from VRBO: Nice place!!! Very comfortable and well stocked. The owner was very accommodating. Cabin was not available for duration of stay so he upgraded us to the main house. Easily accessible. No problems locating it or checking in.Would definitely stay again when we come back to the Big Island. Date of Stay April 19, 2016 Coped from VRBO: My wife and I really enjoyed our stay. If you want to get away from the hotels on the Big Island this is a great way. The house, the guest house and the main house, are off a quiet road allowing a lot of time to enjoy the ocean views and quiet atmosphere. The owner was fantastic, friendly and attentive to our needs.. I recommend highly and will stay again. Date of Stay March 24, 2016 Copied from VRBO: Great communication from the owner no problems finding or getting into the unit. Great location to sit and enjoy your morning coffee on out on the lava with the waves splashing below. Unit had everything we needed very central location. Date of Stay January 2, 2016 Copied from VRBO: Only negative thing was that there was no grill. The description did say there would be one on site. The owner was notified and was going to purchase another one. Great place to stay for the price. Owner of the house is very friendly. Would stay again short term and long term. I highly recommend this house. Ocean very close! Date of Stay September 7, 2015 Copied from VRBO: The house is spotless and everything works great. We finally had a place we could catch up on our laundry. We enjoyed dinners and wine on the water by taking a couple chairs out back. Great internet. We would drive to Hilo everyday, which isn't bad at all. We did the Volcano one day. That also didn't take long to get there. A great deall for this location. The owner sent a guide of things to do. We used that and the Hawaii Revealed book at the home to tour around. So many great places to see. We really discovered this side of the Island. We are already planning our next stay.